I have to wonder whether Journey would have received the same critical and commercial success it enjoyed when it released in 2012 if it would have first launched in 2017 instead. The hyperbole and vitriol around games exactly like Journey (and in some cases ones superior to it) in 2017 stands in stark contrast to the universal acclaim the game received in 2012 on PS3 and again in 2015 on PS4. I’m sure I would have loved it regardless, because I love walking simulators and Journey is still a great one, but it is hard to ignore the bald faced hypocrisy from gamers and other critics regarding the narrative driven adventure genre. Oh well. Rant over. Continue reading my full PS4 Journey review for my thoughts on this incredible experience. Journey is a roughly 2-hour (or less) experience about getting from point A to point B. Your ultimate goal is a mountain far off in the distance topped with a mysterious glowing power. You start out in a desert and eventually climb up and up and up until you reach the snowy mountain peak. And that’s it. That’s Journey. Gameplay consists of walking, occasionally sliding down sand dunes, and jumping and briefly flying when you collect little magical bits of cloth. Some sections introduce magical towers or flying creatures that recharge your power to allow you to fly and jump for extended periods. There are also some magic eating beasts later on that you have to try to avoid, but even if you get caught there is no game over in Journey. You just keep playing. The experience is never challenging or taxing and the light platforming is always easy and straightforward. Journey is just a relaxing stroll through beautiful environments. And I like that. There are collectibles scattered around that can increase your total magic, but they aren’t required to finish the game and only really seem to be included at all to give you something to collect and make it more “videogame-y”. Whether you choose to thoroughly explore each area or not is up to you. The areas in the game aren’t very big so it isn’t as if you can really get lost, but the game also doesn’t ever just point you towards an obvious exit either. Instead it is very intuitively designed where you’ll see something on the horizon or a structure or something and instinctively know that is where you’re supposed to go. A lot of other walking simulators have done a lot of this as well – Lifeless Planet, Abzu, and RiME in particular do the same sort of intuitive world design – but no one else has ever copied Journey’s most interesting feature which is passive multiplayer. While you’re playing Journey other people playing can also be present in your world and help you solve puzzles (usually just activating a bridge or something). You can choose to ignore them if you want, but you can also go on your journey together and it is one of the most amazing experiences I’ve ever had. Your only way to interact is to sort of chirp at each other, but running around and sliding down sand dunes together is surprisingly wonderful. 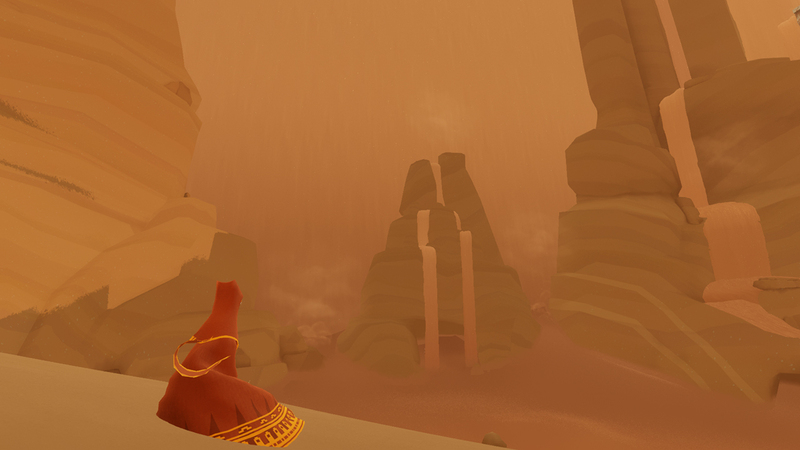 Normally I don’t like other people intruding into my games, but it is absolutely perfectly executed in Journey. Even better, you don’t need PSPlus to experience the multiplayer. 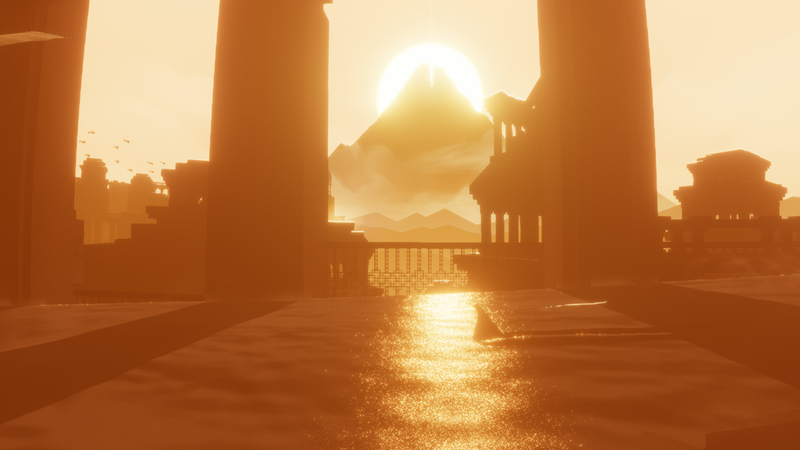 My only complaint with Journey is that the final third of the game is fairly slowly paced. One section has a powerful wind pushing against you that is, honestly, just obnoxious, and the very final climb up the mountain is just glacially paced. I get it that it’s intended to enhance the emotional impact of the overall journey, but it’s definitely a grind. Along with the passive multiplayer Journey is also probably most well known for its gorgeous soundtrack and beautiful graphics. Originally created for the PS3 and given the HD remaster treatment on PS4, the visuals have definitely aged pretty well though I’m not a huge fan of how weirdly shiny the sand can be in certain areas which kind of blows out the image quality with too much contrast (and yes, my TV is calibrated correctly). It still looks great overall, though, and the music is truly incredible. All in all, Journey is definitely a memorable experience that is still right up there with the best walking sims available. I think perhaps some of the impact was diminished for me a bit since I played RiME and Abzu first, and I think both of them are superior to Journey, but it is still absolutely wonderful and well worth playing. I also can’t overstate how great the passive multiplayer is as it really enhances the experience. 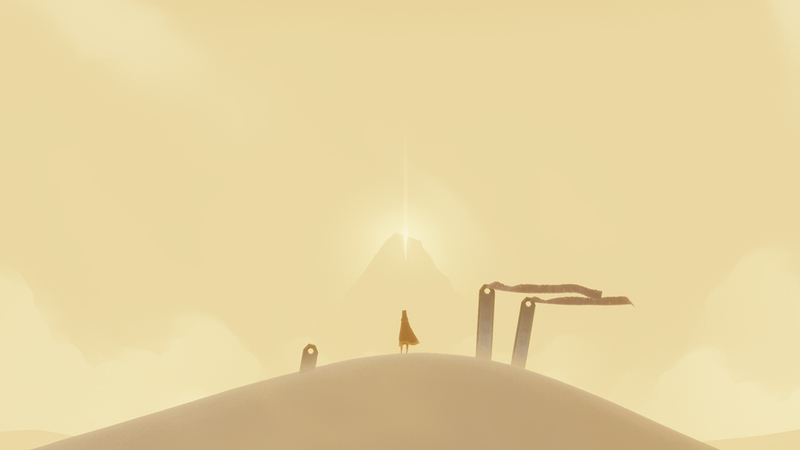 If you somehow haven’t already played Journey on PS3 or PS4 you really need to. It really is that good. Buy it.